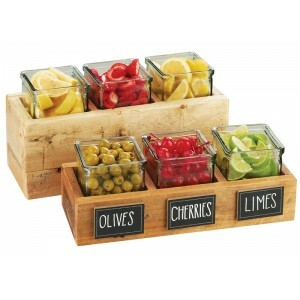 Madera Jar Displays - Cal-Mil Plastic Products Inc. This Vintage Jar Riser is constructed of reclaimed wood which is becoming the latest trend. This jar riser securely holds three 4"x4" glass jars that are perfect for organizing liquid condiments or sugar and cream packets! Constructed of Reclaimed Wood. Also available in 6" to stair-step each riser for more condiments! Add on our Stick on Chalkboard Signage to help organize and label contents.